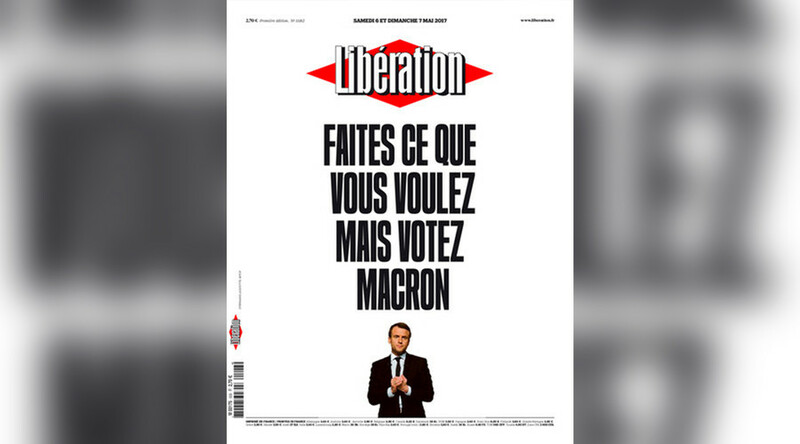 France’s ‘Liberation’ newspaper has called on voters to cast their ballots for Emmanuel Macron on the cover of its pre-election day edition. The move has been criticized on social media, with some users blasting the decision a sign of 'no more democracy'. On the eve of the second round of election, however, the pro-Macron message was published along with a picture of the centrist politician on the cover of the paper. Liberation shared a preview of the cover for the upcoming paper edition on Friday evening. — Libération (@libe) 5 мая 2017 г. The pro-Macron headline didn’t go unnoticed on social media. People took to Twitter to lament what they perceived as a sign of a loss of democracy in the country. “You said freedom of expression?” asked one person, ironically. @Penelope129974 Le même journal qui titre "faites ce que vous voulez mais votez Macron". Vous avez dit liberté d'expression ? — Vincent Delouche (@VincentDelouche) 6 мая 2017 г. — Pont d'Arcole ن 🇫🇷 (@PtdArcole) 6 мая 2017 г. — Cèdre (@CedricDemange) 6 мая 2017 г. — hamelin j-f (@chantaljfh16100) 6 мая 2017 г. “Are you going to delete this tweet … or are you going to override the law?” asked one person in a direct question to the paper. — Lorenzo🔻 φ (@LCensur) 5 мая 2017 г.
It’s not the first time that Liberation has published a provocative political headline ahead of a voting. On April 22, the day before the first round of the French presidential election, the paper’s front cover featured the Republican presidential candidate Francois Fillon and the National Front leader Marine le Pen with the accompanying “anyone but them” headline. The ban on pre-election reporting was nearly disrupted after documents and emails relating to Macron’s campaign leaked online Friday. The presidential election commission urged the media to be cautious before publishing the details. “[The commission] asks media, and in particular [news] websites, not to report on the content of this data,” the commission said. They also warned that distribution “of false information” may lead to criminal charges.